This unit is functional and guaranteed to work. It will be sold as is, no warranty. Freight additional. Unit was close to $20k brand new. Located near Atlanta, GA and available for operational inspection. 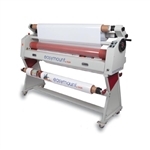 The Wide Rollcut WR61 series has the ability to cut both X and Y axis providing the fastest finish of posters printed in rolls, (transport speed up to 18 meters per minute). HP L25500 60" Latex Printer Seiko W64S 64" Solvent Printer Roland SJ-745EX 74" Solvent Printer, fully refurbished. Easymount Sign 55" PSA Laminator w/Heat Assist, NEW! !